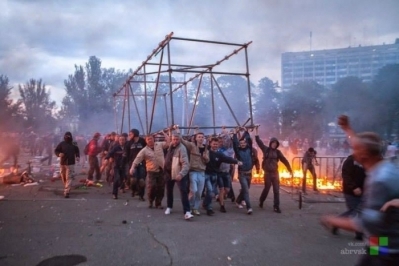 20 months after the deadly disturbances and fire in Odesa on May 2, 2014, Ukraine’s law enforcement bodies have not only failed to properly investigate the events and find those responsible, but are effectively stymieing the investigation. This has forced the 2 May Group, a civic initiative of journalists and various experts, to publicly express their lack of confidence in the Prosecutor General’s Office and Interior Ministry and speak of ‘clear signs of sabotage’. There seems more than enough cause for such criticism. It is over two months since the International Advisory Panel’s Nov 4 report identified serious failings in the investigation and lack of any real progress. That report clearly stated that, given evidence suggesting police complicity, as well as omissions, and the failure of the emergency services to respond in time to the fire, the investigation needs to be carried out by a body independent of the Interior Ministry. The 2 May Group soon afterwards publicly called upon the authorities to pass the entire investigation over to the same Department for Special Investigations within the Prosecutor General’s Office that is finally, albeit slowly, making progress on investigating crimes committed against Euromaidan activists. The criticism and such constructive recommendations have all been ignored. Instead the Interior Ministry team has been reduced to two investigators and there is no visible progress on any front. There is, however, permanent activity on the information war front with Russia and pro-Russian organizations actively pushing a narrative about a ‘massacre’ with the Trade Union building claimed to have been set alight on purpose by ‘Ukrainian radicals’. These are lies that have been used actively to recruit young men to fight in Donbas, and are regularly touted around Europe via a suspiciously well-funded ‘victim’ and highly misleading exhibition. The 2 May Group has worked tirelessly to refute the lies which are also debunked by the findings of the International Advisory Panel. This is simply ignored in the propaganda reports while the failings in the investigation are trumpeted and often claimed to be deliberate sabotage because of things that need to be hidden. It is impossible not to share the 2 May Group’s frustration over the failed investigation. While criticism is mainly directed at the Prosecutor General’s Office [PGO] and Interior Ministry — the bodies purportedly investigating the events, the activists also criticize the Security Service or SBU. The latter has not initiated any criminal prosecutions on separatism charges for which there would be every justification. The 2 May Group writes that following Russia’s invasion of Crimea and the events in eastern Ukraine, some of the anti-Maidan groups, particularly Odesskaya Druzhyna and Narodnaya Druzhyna, “turned into an instrument for dividing Ukraine – so-called ‘federalization’”. It was members of Odesskaya Druzhyna who provoked the disturbances on that fatal day and there is plenty of evidence that this was a planned attack. Whoever started the trouble, it turned into full-scale disturbances with weapons used by both anti-Maidan (or pro-federalism) and pro-Ukrainian unity supporters. 6 people were killed and a further 12 injured by gunshot wounds during the disturbances in the centre. 42 died as a result of the fire which broke out in the Trade Union building on Kulikovo Pole. The fire was caused by a Molotov cocktail, however these were being hurled by activists on both sides and specialists agree that there is no way of knowing whether the fatal incendiary device was thrown from outside the building, or from inside. The Interior Ministry’s Central Investigative Department was put in charge of investigating the riots, establishing the causes of deaths earlier in the centre and in the Trade Union building. They were also responsible for identifying those directly responsible for deaths; establishing where the weapons had come from (and disappeared to); and establishing the motives of the organizers of the troubles. This same police CID was entrusted with investigating suspected negligence by emergency services staff. Most, if not all the deaths in the Trade Union building would have been averted had the fire brigade not taken forty minutes to arrive, despite repeated calls. The Prosecutor General’s Office [PGO] was put in charge of investigating negligence by police officers. Both PGO and the Interior Ministry promised a swift and open investigation, with Interior Minister Arsen Avakov also announcing that foreign specialists would be involved, and that cases would be passed to the court within 3 months. Only one of the people currently facing charges – Serhiy Khodiyak, a Maidan activist — is accused of involvement in these deaths. He is not in custody and members of Euromaidan have consistently tried to obstruct court hearings into the charges against him. Of the 21 pro-federalist activists held in detention for very long periods (with 5 still in SIZO or a remand centre], most are facing vague charges of involvement in riots which could just as well be laid against a huge number of other people that day. There are very serious questions to be answered over why a crucial action plan codenamed Khvylya [Wave] was ready but not registered and therefore did not come into effect. Petro Lutsiuk, the head of the regional police at the time, was placed under house arrest on May 13, 2015, and charged with professional negligence for the failure to register the action plan. Initial optimism that this might indicate real, albeit belated, progress soon fizzled. Lutsiuk was released from house arrest, and although he is supposedly now at the stage of reading the material against him, members of the 2 May Group are sceptical about the case turning into a real prosecution. There have been constant attempts to blame the events on Dmytro Fuchedzhy, then deputy head of the Odesa Regional Police, who fled shortly after the events and is now believed to in Transnistria. It is known that Fuchedzhy supported the pro-federalism camp on Kulikovo Pole and there is video footage showing Fuchedzhy leave the scene with a minor injury in an ambulance almost certainly containing anti-Maidan activist Vitaly Budko [‘Botsman’], a key murder suspect. It was Fuchedzhy who allowed the storming of the police station by pro-Russian activists on May 4 and he personally ordered the release of 63 anti-Maidan activists, most of him were able to escape prosecution. Despite all of this, Ukraine has still not bothered to have Fuchedzhy added to the international wanted list. The investigation was hampered from the outset by the destruction of material evidence during the night after the disturbances when the communal services were deployed in cleaning the streets. The 2 May Group reports that there was no attempt to cordon off areas where crimes had been committed, nor to carry out a proper inspection of the terrain. The Trade Union building in turn was only closed to public access a month after the fire. Incredibly, the official inspection of the building failed to notice evidence, including bullet marks, demonstrating that firearms had been used to shoot at pro-Ukrainian activists from within the building. This was only added to the file material after the 2 May Group’s expert pointed it out. The 2 May Group calls the list of firearms removed absurdly short and notes that video footage shows that a much greater number of weapons were used. Some were taken from anti-Maidan activists and handed to the police, however there is no information as to what happened to them. The weapons used to kill Euromaidan activists Ihor Ivanov and Andriy Biryukov, and anti-Maidan activist Hennady Petrov have never been found. This is despite the fact that the bullet which killed Andriy Biryukov came from a weapon which is quite unusual in Ukraine and needs a special licence. The 2 May Group is convinced that the investigation into the fire “is clearly being sabotaged at the highest level in the Interior Ministry”. The Prosecutor General’s Office has narrowed the number of police officers accused of criminal inaction to just one person – Lutsiuk and is openly sabotaging the transfer of this case to an investigative body independent of the police and PGO. The charges against Lutsiuk could also be laid against Volodymyr Bodelan, then head of the Odesa Emergency Services. Bodelan has admitted that he was personally responsible for delaying the fire brigade for 40 minutes. He finished his contract as planned, then stood for election to parliament. He disappeared for a few months after Lutsiuk was arrested, and liberally gave interviews to the Russian media full of misleading information and minimizing his role in the events. He recently returned, and obviously has his reasons for believing himself to be safe from prosecution. An internal inquiry with the emergency services department found that nobody had been at fault, and the supposed criminal investigation is being carried out, as the international panel observed, by the Interior Ministry which cannot be considered an independent body. There are no suspects, which the 2 May Group points out, allows the Interior Ministry to drag out the case indefinitely. Failure to properly investigate events in which people lost their lives is a clear breach of the European Convention on Human Rights. This, as well as the numerous other failings in the so-called investigation, make it extremely likely that the European Court of Human Rights will in future issue judgements against Ukraine. Ukraine’s law enforcement bodies are thus sabotaging an investigation which is of critical importance for Odesa and for Ukraine as a whole, given the cynical propaganda lies circulated about the tragic events. It is not only the victims and their families who have been betrayed.